Operating under the name of the beverage than made the Gods on the Olympus immortal, Ambrozijn is a wondrous folkband with inventive musicians, feet in traditional folk music and head in the clouds. 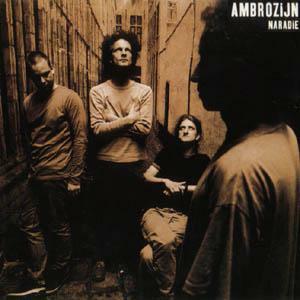 With "Naradie", Ambrozijn has delivered its second album. The musicians of Ambrozijn are active on other fronts in the Flemish Folk scene (eg. Wouter Vandenabeele has another big project in the folkbigband Olla Vogola, Tom Theuns just recorded a CD filled with American bluessongs with singer Vera Coomans ...), but with the combination here present they rapidly have found their own place in the rostrum of folkbands from Belgium. This has led to the band to a record deal with major Virgin Records. "Naradie" provides the listener with a mixture of age-old traditional songs, a number of self-written songs (not the lesser by any means) and a modern sound through the arrangements of this material. The limited number of musicians/instruments (only violin, guitar, accordion, vocals), gives the music room, leaves space to include silence. Also striking is that the percussion instruments (even the ones that are common in western-european folk) are absent: only a handful of tracks have a rhythm track, and even then it is only a modestly tapped tambourine, a carefully shaken shaker, some footsteps, or the held-back eastern percussion of guest musician Bhaia Marakchi Abdellah. This makes Naradie a record full of tension, one that radiates calmness and languishes in nostalgic moods. And there's not much that distracts from the main assets of the band : musicality and melody. The two tracks that stand out are the two Tom Theuns-compositions "Naradie" (which is also the single) and "Wee Mij". It's been since "Laïs" that a folk-cd has given me so much pleasure, although the success of these girls will not likely follow for Ambrozijn. The sound is a little bit less radio-ready. Tant pis. You know the way. - Christian Moll in Folkworld : "Ambrozijn is a very innovative band - they have found there very own very special sound. It is often amazing how full the sound of a band with only three instrumentalists can be - the lads know how to play and arrange their instruments effectively ... A special band and a special album - worth to be heard!". - Dag Allemaal : "Energiek pulserend, wars van elk dogma en nooit toegevens aan makkelijke oplossingen levert het onmiskenbaar hippe Ambrozijn met deze cd een knap en meeslepend werkstuk af." - Peter de Rop in Het Nieuwsblad : "De vier jongemannen van Ambrozijn hebben met Naradie een heel genietbaar klankenpallet afgeleverd waarop niet alleen hun technisch kunnen maar vooral hun muzikaliteit in het oog en het oor springt". You can order this CD from a number of locations (prices researched on September 25, 2000, but nothing guarantees they still are the same when you read this).